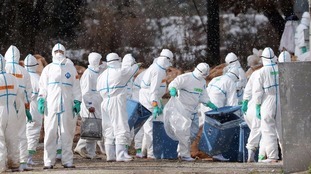 The latest case of bird flu in China, which appears to be related to a substrain of the H10N8 virus, is already displaying some worrying characteristics, an expert in infectious diseases has said. We should always be worried when viruses cross the species barrier from birds or animals to humans as it is very unlikely that we will have prior immunity to protect us. We should be especially worried when those viruses show characteristics that suggest they have the capacity to replicate easily or to be virulent or resistant to drugs. This virus ticks several of these boxes and therefore is a cause for concern. A new and deadly form of bird flu has claimed its first confirmed human life. The previously-unknown substrain of the H10N8 virus killed a woman who was admitted to hospital in China with fever and pneumonia, test results revealed. The 73-year-old woman, from Nanchang City in Jiangxi province, died nine days after becoming ill despite antibiotic and antiviral treatment. She visited a live poultry market a few days prior to infection, suggesting an incubation time of around four days - similar to that of other bird flu strains. The strain is believed to have spread from poultry and may pose a pandemic threat to the human population, experts said. Reports suggest at least one other person is critically ill in hospital after being infected by the same strain in Jiangxi Province. The World Health Organisation has warned of a new strain of bird flu. There has been nothing like it since the killer virus of a decade ago. A wholesale chicken meat dealer told me his sales have dropped by 90%, despite official advice that cooked meat does not pose a bird flu risk. Scientists are watching the H7N9 virus closely to see if it could spark a global pandemic but say there is little evidence so far that it can spread easily from human to human. In comparison, the earlier bird flu strain, H5N1, is known to kill up to 60 of every 100 people it infects. Experts said they still are not sure how people are getting infected but said evidence points to infections at live poultry markets, particularly through ducks and chickens. However they added that it was encouraging that reported infections appeared to slow after the closure of live poultry markets in affected areas. The World Health Organisation's (WHO) top influenza expert, Dr. Keiji Fukuda, said that people appear to catch the latest 'bird flu' virus, H7N9, from birds more easily than the H5N1 strain that began ravaging poultry across Asia in 2003. Health experts are concerned about H7N9's ability to jump to humans, as well as the strain's capacity to infect birds without causing noticeable symptoms - making it difficult to monitor its spread. Read more: Can you die from the H7N9 bird flu virus? "This is definitely one of the most lethal influenza viruses we have seen so far," Dr Fukuda said. But he added that experts are still trying to understand the virus, and that there might be a large number of mild infections that are going undetected. The H7N9 bird flu virus has infected more than 100 people in China, seriously sickening most of them and killing more than 20, mostly near the eastern coast around Shanghai. China's eastern Jiangsu province said two new H7N9 bird flu cases have been confirmed today, bringing the total number of reported infections nationwide to 16. Six people have died in the latest outbreak, but authorities stressed the virus remained responsive to the drug Tamiflu and those who were diagnosed early could be cured. Leading virologist Professor John Oxford has said he is confident of China's ability to deal with the current outbreak of bird flu. He told ITV News: "China is pretty organised these days ... If anyone is going to deal with it, I think they can." But he said the outbreak is still concerning because "it has killed almost half of the people it has infected so far". He added that it would be of much greater concern if evidence emerged of it spreading from human to human. Read: Can you die from the H7N9 bird flu virus? He also urged anyone with plans to travel to China not to cancel them, but advised staying away from poultry markets and farms. Read the Foreign Office advice on travelling to China here. Can you die from the H7N9 bird flu virus? Is this strain of bird flu deadly? Most previous H7 infections have resulted in conjunctivitis and mild upper respiratory symptoms, but there has been one confirmed death. Chinese authorities have reported six deaths resulting from the H7N9 virus. Other symptoms include severe pneumonia, fever, coughing and shortness of breath. How can humans catch it? H7 influenza viruses tend to infect birds but there have been some cases of birds infecting humans, most recently in China. The most likely cause of H7N9 transmission is from birds to animals, since in most cases the humans had contact with birds. Human-to-human transmission is still a possibility. Is this like previous outbreaks of bird blu? Other strains of bird flu, such as H5N1, have been circulating for many years and can be transmitted from bird to bird, and bird to human, but not generally from human to human. The number of confirmed cases is still very low compared to H5N1 and H1N1 outbreaks. 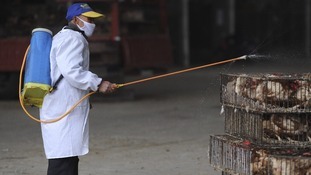 More than 20,000 birds have been slaughtered at a poultry market in Shanghai as a precaution against the spread of a new strain of bird flu. The Huhuai market was closed down and disinfected after the H7N9 virus was detected in samples of pigeons in the market. City authorities have also suspended poultry sales at two other markets and ordered a thorough disinfection of the premises. In Shanghai, the rising death toll has prompted some residents to stay away from markets with live chickens and ducks.